The Basic Five contains everything you need to begin homeschooling with The Weaver Curriculum. Volume 1 covers Genesis 11-50 for grades K-6. 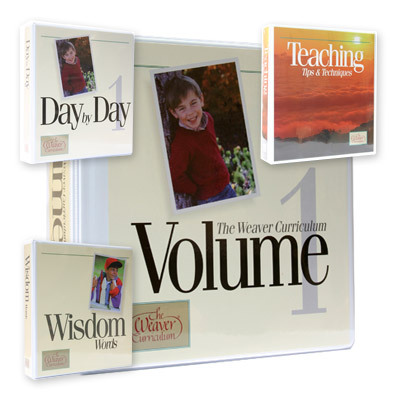 Day by Day 1 contains lesson plans that correspond with Volume 1. Wisdom Words is a complete grammar and composition course for grades K-6. Teaching Tips & Techniques is a training book for the homeschooling parent. Skills Evaluation is a comprehensive listing of the skills your child needs to know by the time they reach 6th grade. And last but not least, the Teacher's Friend is included. This free little booklet has the information you need to get you started on your homeschool journey, from opening the binders to opening minds. You'll be happy to know that when you purchase The Basic Five you'll receive a discount. You'll save money buying this starter package! As you can see, Alpha Omega Publications has kept your budget in mind. Not only will you be prepared on the first day of your homeschooling journey by ordering this set, but you will also have some change to spare for other curriculum needs. Sound fantastic? Order The Basic Five today from Alpha Omega Publications and start your adventure with The Weaver Curriculum! You'll be glad you did.